There's a website called Arcane Knowledge written by a Catholic named Daniel J. Castellano that includes several articles on Special Relativity that try to argue that the theory doesn't entail eternalism (the view that all moments of time have equal existence). Now if you've read my blog at any length, you know I'm a big proponent of the view that Special Relativity does necessitate eternalism. So naturally, I disagree with much of what is written on the site. Many of the theists I've debating eternalism with have cited this website and its arguments against the reality of a 4 dimensional spacetime block universe. (Not surprisingly, they've all been Catholics subscribing to Aristotelian-Thomistic metaphysics). Through a year long debate with a Catholic who frequently cited Arcane Knowledge in an attempt to deny Special Relativity entails eternalism, I've constructed an argument below showing how the arguments used on Arcane Knowledge to deny eternalism forces one into a dilemma: either (a) affirm you are the only thing that exists at any given present moment for you (literally deny the existence of everything else), or (b) be forced to agree events in the past and future exist (effectively affirming eternalism). Over on the site, Daniel argues that from any event considered present, no events in the absolute future or past will have any objective ontological status, but any events in "elsewhere" could physically exist. 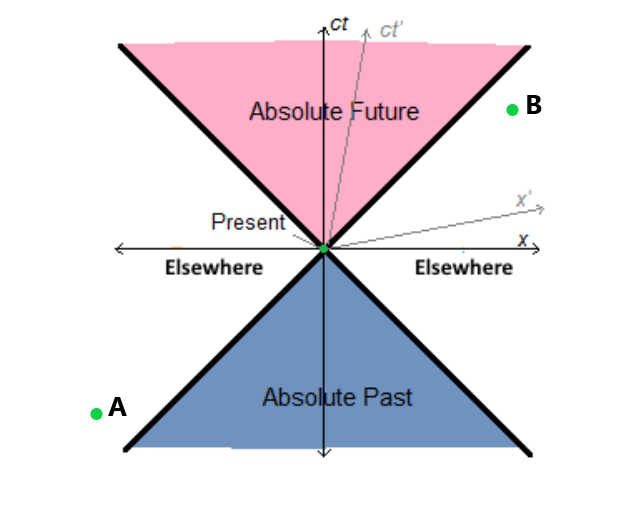 In Special Relativity, "elsewhere" is a term given to all the places not in an event's absolute future or past (which are its future and past light cones, respectively). In other words, elsewhere is the totality of spacelike separated events. According to Daniel, one cannot say whether any events in elsewhere exist when one is at the present moment, seen below in the spacetime diagram as a green dot (the coordinates of this dot at (0,0) on the X and Y axis). It is physically possible, according to this view, that any set of events can possibly exist in elsewhere. This interpretation of Special Relativity is problematic in several ways, and I will show how. If an event's absolute future and past objectively doesn't exist, this would have to apply to all other events that exist, since there's nothing special about any given event we make the center of a spacetime diagram. Given this rule, no other events can exist in elsewhere that are in the absolute futures or pasts of any other events in elsewhere. 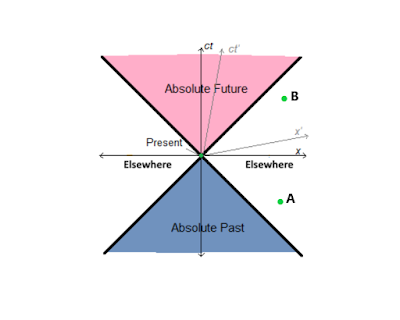 For example, in the diagram below, it is possible events A and B can exist, since they're not in each other's absolute future or past. But in this diagram below, it cannot be the case that both events A and B exist, since event A is in the absolute past of event B, and event B is in the absolute future of event A. 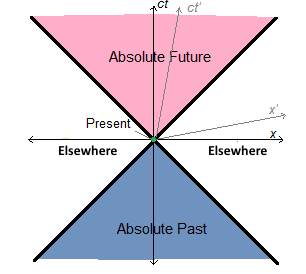 A quick side note of what is meant by the absolute future and past: The absolute future and past of an event are all the areas relative to that event's location where all inertial frames would agree are objectively in the future or in the past if they were all in that event's location, even if they're moving relative to each other. They are the future and past light cones. Happy New Year! As we embrace a new year amidst the ongoing government shutdown (which isn't affecting me at all), newly sworn in congresswoman Alexandria Ocasio-Cortez said in an interview with 60 minutes that top tax rates on the super rich for income above $10 million should be 70%! The conservative blogosphere predicatbly blew up. This all got me thinking about tax rates again. Back in May of 2017 I proposed a tax plan with a rate of 45% for income above $10 million, far lower than Cortez's 70%. Many have claimed that her rate is far too high. Too "radical" as Anderson Cooper described it. It definitely seems radical, even when you consider that the highest marginal tax rates in the 1940s and 50s were as high as 94%. Peter Diamond, Nobel laureate in economics and arguably the world’s leading expert on public finance. (Although Republicans blocked him from an appointment to the Federal Reserve Board with claims that he was unqualified. Really.) And it’s a policy nobody has ever implemented, aside from … the United States, for 35 years after World War II — including the most successful period of economic growth in our history. Continuing on with my love of Pew Research's surveys on religious trends, they recently put out an interactive map that shows you the religiosity of 34 European countries according to 4 factors: (1) importance of religion; (2) religious service attendance; (3) frequency of prayer; and (4) belief in god. Romania is the most religious European country in their overall combined index, Estonia the lowest. Armenia has the highest level of belief in god with "with absolute certainty" with 78%, and Germany is the lowest with 10%. Greece has the highest percentage of people who say religion is very important in their lives, with 55%, and Estonia is the lowest with a mere 6%. Moldova has the highest percentage of people who say they pray daily, at 48%, and the UK has the lowest at just 6%. Poland has the highest percentage of people who say they attend religious services at least monthly, at 61%, and Finland has the lowest at 10%. It seems that the most religious countries in Europe are roughly on par with where the US is. But the US will be catching up with the rest of Western Europe in a generation or so, if the numbers continue at the rate they are now. Unfortunately, embedding the tool doesn't seem to be working, so click this link here to check it out. Screenshot below for reference. Pew is a treasure trove of cultural and demographic data for nerds like me. I can spend hours on the site pouring over all their new studies. 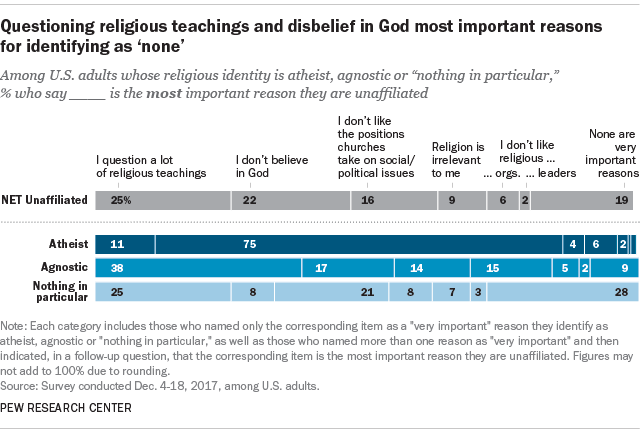 In another survey of Western Europe, it shows how most unaffiliated adults were raised Christian, disconfirming the misconceived idea that if two Christians have a kid, that kid will be a Christian its entire adult life. 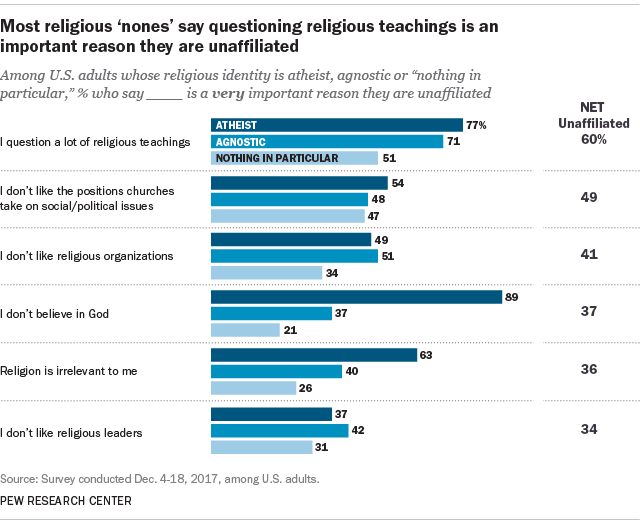 Assuming kids will all keep the same religion of their parents is what lead Pew a few years back to over estimate the rise of the percentage and absolute numbers of the world's religious population by 2050. From the recent study, you have an 86% chance of having been raised Christian if you're not currently religious in Spain. And the median number of the unaffiliated raised Christian in Western Europe is 60%. I recently came across this video from Vice about The Satanic Temple's push to get a plurality of religious representation at the Arkansas state capitol grounds. The back story is that they have a monument to the 10 Commandments on government property, violating the separation of church and state, and if not removed it should at least be accompanied by monuments to other religions, like Satanism. Seems fair enough, but of course this is not going over well in the deep Christian south. It is amusing to see just how real residents of the state take the statue of Baphomet — a catoonish representation of the "Adversary." They literally believe a statue will bring upon Satan's wrath. It goes to show you how far we still need to progress on the secularization of the US. Some people, I think, for reasons not fully known to me, will just never understand the concept of 4 dimensional spacetime. I've been engaged in a year long debate with a contributor to the Strange Notions site on my blog over Special Relativity's entailment of a 4 dimensional spacetime block, and despite dozens of images and a book's worth of explaining, he just doesn't get it. I've come to the conclusion that to the lay person who has not bothered to learn Special Relativity, it is very hard if not impossible to explain this without the help of a realtime conversation and the ability to illustrate arguments. What really bugs me is when people make claims about Special Relativity or spacetime, or any of its implications, who have clearly not bothered to learn or understand the basics of the theory. But such is the case. Willful ignorance comes natural to us, so I can't say I'm surprised when I experience it. I stumbled across a paper by Argentinian physicist Gustavo Romero, who's written several papers on the 4 dimensional block view. In his paper he quotes MIT physicist Max Tegmark on time as the fourth dimension and its illusory nature. It's interesting to hear the dominant view among physicists, which so profusely contradicts our everyday experience of reality in the manifest image. Time is the fourth dimension. The passage of time is an illusion. We have this illusion of a changing, three-dimensional world, even though nothing changes in the four dimensional union of space and time of Einstein’s relativity theory. If life were a movie, physical reality would be the entire DVD: Future and past frames exist just as much as the present one.